The cubes are packed, software has been tested, playlists have been made for the road, and we have snacks to munch along the way. 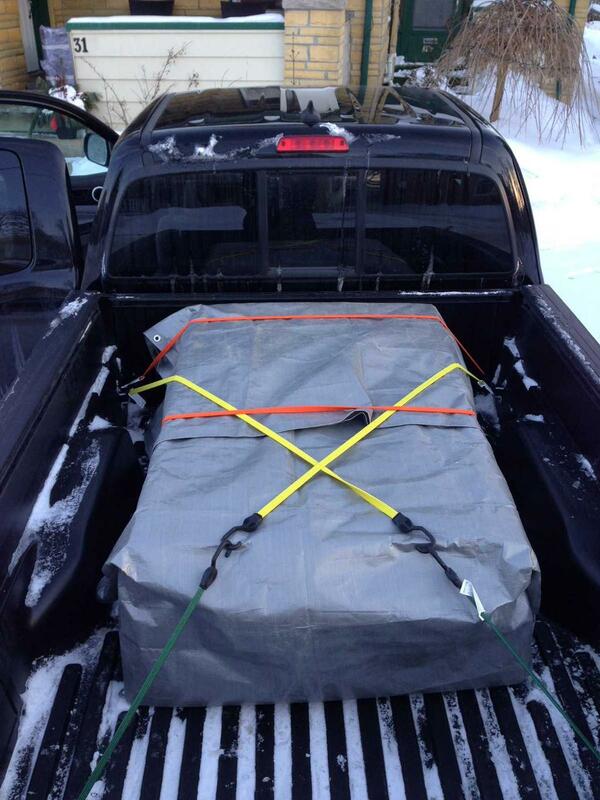 We’re on our way to Montreal for Art Souterrain, and we can’t wait to share our latest installation with you! TouchCubes will be showing at the Centre de Commerce Mondial de Montreal, which is located at 747, Car Victoria. We’ll be there in person on opening night between 8pm and 1am on Saturday February 28th. 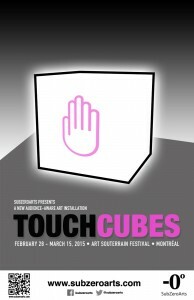 No worries if you can’t make it out then, TouchCubes will be on display until March 15th. We’ll be livetweeting throughout the weekend so if you’d like to keep up to date with what’s happening be sure to follow us at @SubZeroArts on Twitter. Gotta run, we have a lot of driving to do today. Speak to you soon! 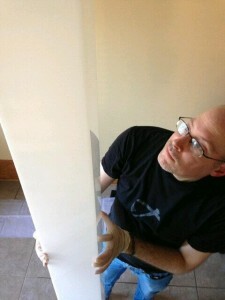 TouchCubes Debuts One Week From Today! 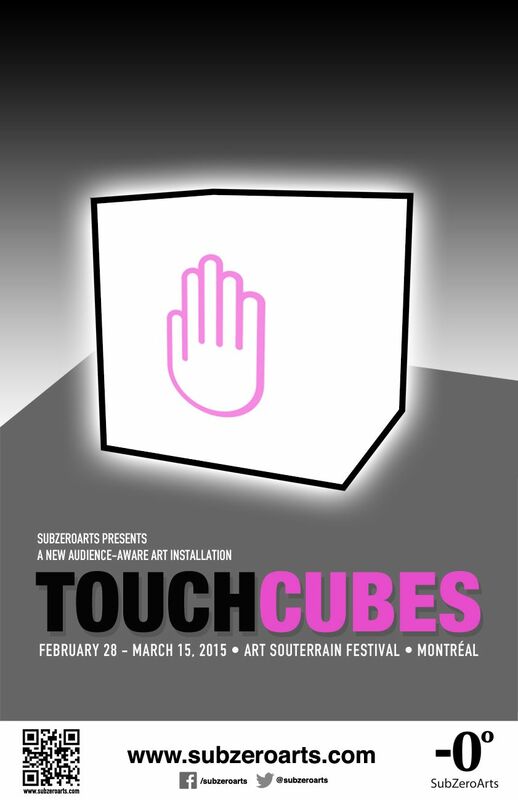 One week from tonight we’ll be in Montreal to debut our latest installation TouchCubes as part of Art Souterrain, and we are totally looking forward to meeting you all! We’ve been hard at work cutting acrylic, checking connections, wiring wires, and making countless trips to the hardware store, all with the intention of making the most awesome installation we can for you to enjoy. We can hardly wait for you to see it! A few more details for those of you who have been asking: TouchCubes will be showing at the Centre de Commerce Mondial de Montreal, which is located at 747, Car Victoria. We’ll be there in person on opening night Saturday February 28th, but if you can’t make it out then, TouchCubes will be on display until March 15th. We hope you’ll be able to stop by! Last but not least, we’re always grateful to those of you who have asked if we need any help putting TouchCubes together, and we always appreciate your support. The best thing you can do would be to tell your friends about us, and help signal boost what we’re doing by sharing our posts on your Facebook, Twitter, Tumblr and what have you, and of course we would be thrilled if you’d like to make a donation to cover some of our costs! Gotta run right now, we have about 60 gazillion things to do today, but we look forward to chatting with you again soon! 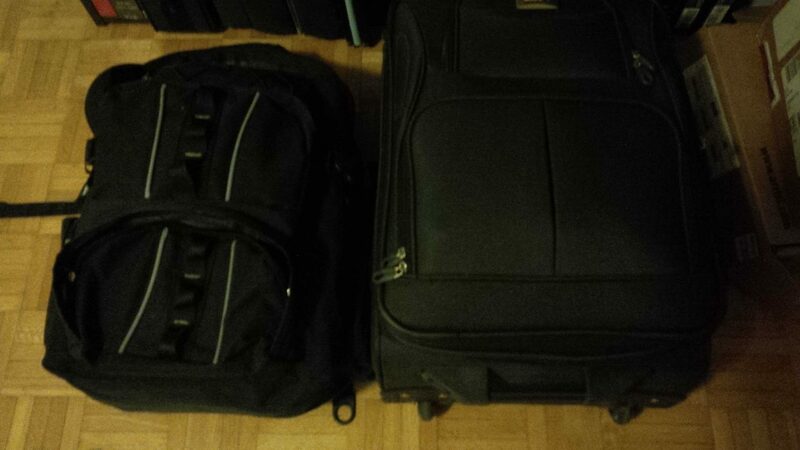 Our bags are packed, Carolyn has selected appropriate snacks for the train, and the Kobo is fully charged. The train leaves Toronto at 9:25 sharp and arrives in Ottawa at 2:30pm. Then it’s getting everything set up and organized, maybe a quick shower and a change of clothes then it’s showtime! We do hope that you’ll be joining us for the debut of MNML at the Ottawa School of Art (Room 306) as part of Nuit Blanche Ottawa+Gatineau, we promise that it’ll be worth the visit. And if you can’t make it out by virtue of geographical misfortune, that’s totally okay, we’ll be sure to take lots of pictures for your later viewing! As I type this, my apartment is awash with the glow of MNML. It looks great, and we are sooooooo excited to be able to share it with you at Nuit Blanche Ottawa+Gatineau! Be sure to come out to see us at the Ottawa School of Art on Saturday September 20th from 620pm to 421am, we’re really looking forward to seeing you! Nuit Blanche Ottawa+Gatineau is less than a week away and we still have a ton of things to do, but we’re getting things done and we’re totally excited to be able to unveil MNML! We’ve confirmed that we’re in Room 306 at the Ottawa School of Art, and we’re really looking forward to seeing you! 1) Spread the word! Give us a signal boost! Like us on Facebook! Retweet some of our tweets! Help us let everybody in Ottawa know that they should come see MNML! Tell your friends about us, send them a link to our site, post a blog about us and let your readers know what we’re doing! Tell people about us and let them know they should come out to support us! 2) Make a donation to SubZeroArts! 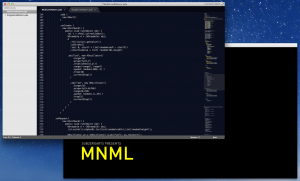 It costs a lot of money to do an installation like MNML and we’d be thrilled if you wanted to contribute to our costs! We’ve set up a donations page on our website if you’d like to help us out that way. 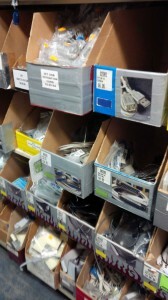 Or maybe you have an idea about how you’d like to help? Let us know what you think, we’d love to hear from you! Tags: cables, Everything is starting to take shape..., Installation, MNML, NBOG, Nuit Blanche Ottawa Gatineau, So What Can I Do To Help? We’ve been hard at work on MNML for a few weeks now, and with only nine days left to go before Nuit Blanche Ottawa+Gatineau,we’re happy to report that everything is coming together quite nicely, thank you for asking! Programming is coming along smoothly as evidenced by the screenshot to your left, planning and logistics are falling into place, and we’re feeling pretty good about everything so far. We still have a long way to go over the next few days but we’re moving along according to schedule and we’re feeling pretty good about that! By the way, we wanted to let you know that we’re presenting in a different location this year! We’re really excited to be showing MNML at the Ottawa School of Art (35 George Street) and while we’ll miss all of our friends who hosted us at Club SAW for the last two years, we’re really looking forward to making some new friends at a new venue! Gotta run, we have about eight things left to do tonight if we want to stay on schedule, but we’ll be in touch with you all again very soon. In the meantime, if you haven’t already, why not like us on Facebook or follow us on Twitter so you can keep up to date with everything that’s going on with MNML? We’re on our way to Ottawa! Nuit Blanche Ottawa Gatineau is tomorrow night! We’re heading out to Ottawa today and we’ll be setting up everything tomorrow afternoon. To say that the last few weeks have been overwhelmingly busy would be an understatement, but after our test run yesterday we’re quite convinced that it’s all worth it and we hope you’ll agree when you see what we’ve done. We’ll have limited internet access over the next few days, but we’ll do our best to keep in touch via Twitter, so please be sure to follow us if you haven’t already. We’re very excited about sharing Pillars of Light with you, and we very much look forward to seeing you there! Another very exciting sketch on a napkin! 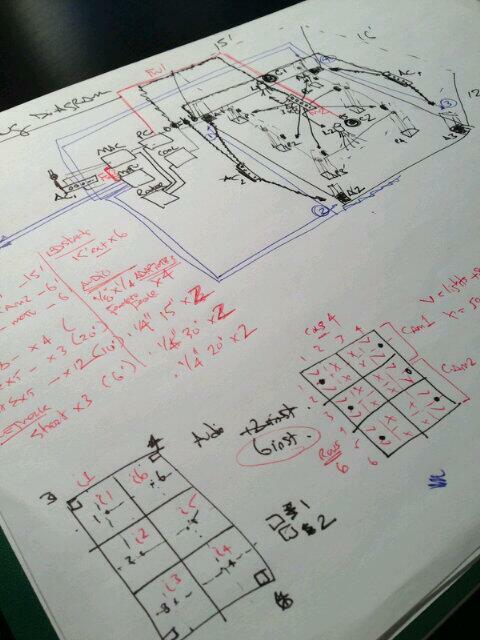 Reader response to our last sketch on a napkin post was very enthusiastic, so we thought you’d like to see an even more exciting and technical sketch. Obviously we can’t tell you what it all means exactly (we do like to keep some air of mystery at times), but we trust that this very exciting document will further whet your appetite for Pillars of Light! By the way, we’d be most grateful if you’d tell your friends about what we’re doing. Obviously we’d like as many people to come see Pillars of Light as possible, so it would be greatly appreciated if you could spread the word on Facebook or Twitter or whatever social networking media you’re most fond of. Speaking of social media, if you haven’t already RSVP’d to Pillars of Light via Facebook by all means please do! We’re looking forward to seeing you all and we’ll be sure to say hi on the 21st! We’re pleased to report that we’re moving along according to schedule, and we’re almost ready for next week’s debut of Pillars of Light. We’re really looking forward to seeing you at Nuit Blanche Ottawa Gatineau next week, and if you haven’t already RSVP’d through Facebook by all means please do so we know to look for you. We can hardly wait to see you!